From this point, there is a nice, well maintained trail, following the historic rail bed about 3/4 of a mile from Mt. Lowe Road, south on a shallow down grade to Echo Mountain. I uploaded my snapshots from the walk, and placed them roughly where they were taken on the map. Make sure you switch to Satellite view (upper right corner) so you can zoom in closer. I met lots of nice people, and I hope I meet them again soon. Before walking back to the cars, we sat and had a picnic in the shady area just west of the Echo Mountain House ruin, known as the tennis courts. I got some nice hand-drawn maps from Brian Marcroft, and found out about his web site, mtlowe.net where I found a topo-map of Mt Lowe and the trails leading to it. 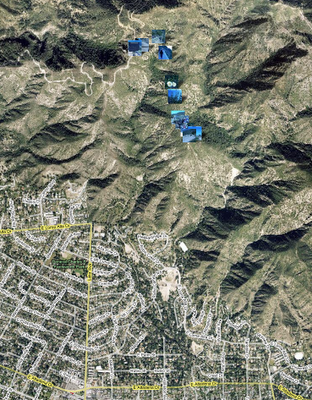 I added those to my Altadena Crest Trail map project.